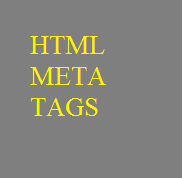 HTML offers web authors three ways for specifying lists of information. All lists must contain one or more list elements. <ul> − An unordered list. This will list items using plain bullets. <ol> − An ordered list. This will use different schemes of numbers to list your items. <dl> − A definition list. This arranges your items in the same way as they are arranged in a dictionary. An unordered list is a collection of related items that have no special order or sequence. This list is created by using HTML <ul> tag. Each item in the list is marked with a bullet. If you are required to put your items in a numbered list instead of bulleted, then HTML ordered list will be used. This list is created by using <ol> tag. The numbering starts at one and is incremented by one for each successive ordered list element tagged with <li>. <ol type = "1"> - Default-Case Numerals. <ol type = "I"> - Upper-Case Numerals. <ol type = "i"> - Lower-Case Numerals. <ol type = "A"> - Upper-Case Letters. <ol type = "a"> - Lower-Case Letters. <ol type = "1" start = "4"> - Numerals starts with 4. <ol type = "I" start = "4"> - Numerals starts with IV. <ol type = "a" start = "4"> - Letters starts with d.
HTML and XHTML supports a list style which is called definition lists where entries are listed like in a dictionary or encyclopedia. The definition list is the ideal way to present a glossary, list of terms, or other name/value list. Definition List makes use of following three tags. 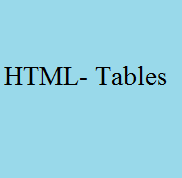 The HTML tables allow web authors to arrange data like text, images, links, other tables, etc. into rows and columns of cells. Here, the border is an attribute of <table> tag and it is used to put a border across all the cells. If you do not need a border, then you can use border = "0". Table heading can be defined using <th> tag. This tag will be put to replace <td> tag, which is used to represent actual data cell. Normally you will put your top row as table heading as shown below, otherwise you can use <th> element in any row. Headings, which are defined in <th> tag are centered and bold by default. There are two attributes called cellpadding and cellspacing which you will use to adjust the white space in your table cells. The cellspacing attribute defines space between table cells, while cellpadding represents the distance between cell borders and the content within a cell. You will use colspan attribute if you want to merge two or more columns into a single column. Similar way you will use rowspan if you want to merge two or more rows. bgcolor attribute − You can set background color for whole table or just for one cell. background attribute − You can set background image for whole table or just for one cell. You can also set border color also using bordercolor attribute. Note − The bgcolor, background, and bordercolor attributes deprecated in HTML5. Do not use these attributes. Here is an example of using background attribute. Here we will use an image available in /images directory. This will produce the following result. Here background image did not apply to table's header. You can set a table width and height using width and height attributes. You can specify table width or height in terms of pixels or in terms of percentage of available screen area. The caption tag will serve as a title or explanation for the table and it shows up at the top of the table. This tag is deprecated in newer version of HTML/XHTML. Tables can be divided into three portions − a header, a body, and a foot. The head and foot are rather similar to headers and footers in a word-processed document that remain the same for every page, while the body is the main content holder of the table. <thead> − to create a separate table header. <tbody> − to indicate the main body of the table. <tfoot> − to create a separate table footer. Comment is a piece of code which is ignored by any web browser. It is a good practice to add comments into your HTML code, especially in complex documents, to indicate sections of a document, and any other notes to anyone looking at the code. Comments help you and others understand your code and increases code readability. HTML comments are placed in between <!-- ... --> tags. So, any content placed with-in <!-- ... --> tags will be treated as comment and will be completely ignored by the browser. Comments do not nest which means a comment cannot be put inside another comment. Second the double-dash sequence "--" may not appear inside a comment except as part of the closing --> tag. You must also make sure that there are no spaces in the start-of comment string. Here, the given comment is a valid comment and will be wiped off by the browser. span through as many as lines you like. Conditional comments only work in Internet Explorer (IE) on Windows but they are ignored by other browsers. They are supported from Explorer 5 onwards, and you can use them to give conditional instructions to different versions of IE. You will come across a situation where you will need to apply a different style sheet based on different versions of Internet Explorer, in such situation conditional comments will be helpful. 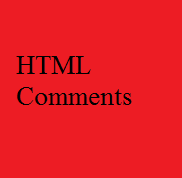 Note − The <comment> tag deprecated in HTML5. Do not use this element. Though you will learn using style sheets with HTML in a separate tutorial, but here you must make a note that if you are using Cascading Style Sheet (CSS) in your HTML code then it is recommended to put that style sheet code inside proper HTML comments so that old browsers can work properly.